Top Eliminator was the second up-charge attraction at the park after Sky Coaster was installed the year before. Lagoon was scheduled to be the first park to open the ride in Spring 1996, but problems with the computers delayed the opening until August. Meanwhile, another Top Eliminator began operating at Kentucky Kingdom in Louisville. International Armoring in Ogden, Utah² helped produce the dragsters for Superstar Dragsters of Canada. The ride was sponsored by local car dealer Young Chevrolet. When Lagoon was seeking approval for the ride from the Farmington City Council, concerns arose about the noise created by the ride. This was addressed by adding special mufflers to the dragsters and a 12-foot-high berm north of the ride, bringing the amount of noise down from about 80 decibels to about 50 decibels as measured from the nearest residence, about 750 feet away. In addition, a new gift shop called Pit Row was built between Sky Scraper and Boomerang. Rides were purchased at the front counter (originally $15 for 2 runs and later $12 for 3 runs) and then drivers watched a training video in a small room in the northwest corner of the building. Operators in the control tower could communicate to the drivers in their cars via one-way radio. The drivers controlled the acceleration and shifting of the vehicles as they traveled down the 188-foot-long track at speeds up to 75 or 80 mph. After passing the finish line, the cars were brought to a stop by a 120-foot roller coaster braking system and then pulled back to the staging area for another run. 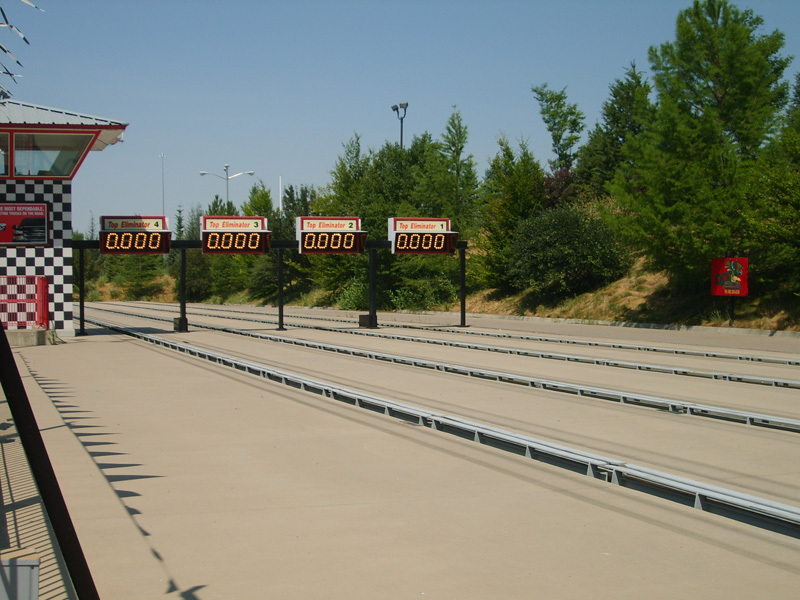 Times were displayed for each racer above their lane. Non-riders could watch from inside Pit Row or outside on the south side of the track. When Top Eliminator was installed, the concrete grandstand that was part of the Lagoon Stadium since the mid-1960s still stood, unused, to the south. It may or may not have been intentional, but the Top Eliminator track was placed on what used to be the home stretch of the old Race Track which first opened in 1911. A newspaper article mentioned an option to add more lanes and that Lagoon had room to. It must not have been seriously considered because even though the grandstand was torn down around 1998, Double Thunder Raceway was built in its place in 2000. That was also the year Lagoon categorized these up-charge rides as the X-Venture Zone. The ride closed for good in 2011. With the ride gone, construction could begin on a new mega coaster planned for the area. The windows in the back of Pit Row covered up and large green boards were placed along the south fence as the ride was dismantled and the berm was leveled. Some of the trees from the berm were transplanted elsewhere in the park, but the trees at the west end of the track were retained. Pit Row remained open until October 2014 with the north portion of the building sectioned off for storage. 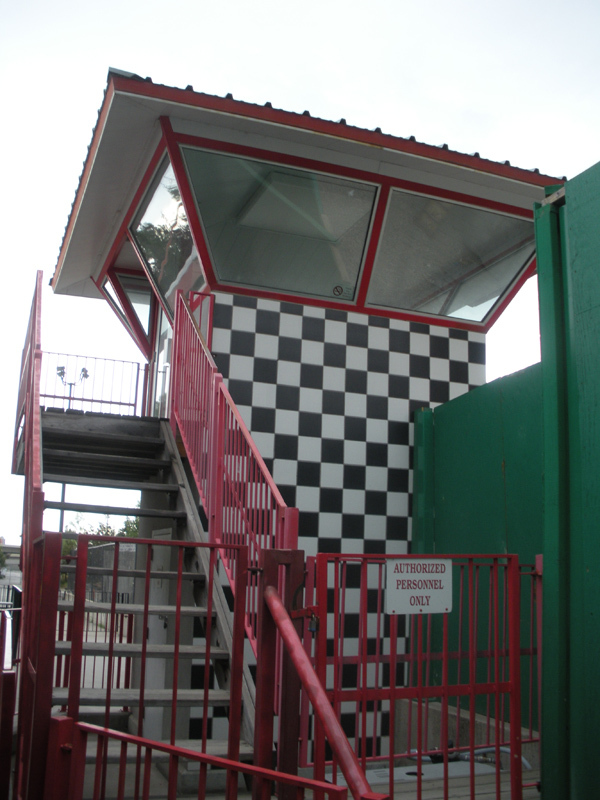 The control tower remained intact until the 2014/15 off season. The top half of it can now be seen in the bone yard north of the park. Most of the area once occupied by Top Eliminator is now part of a plaza for Cannibal. When the park opened for 2016, the Pit Row building reopened as a gift shop exit for Cannibal. The Pit Row sign was moved to the south end of the building and the doors that once led out to Double Thunder were transformed into a ticket window for X-Venture Zone rides. The video below includes footage of Lagoon’s Top Eliminator along with other installations of the ride. For example, you can catch a brief glimpse of the old grandstand at the 2:13 mark. 1. Superstar Dragsters was later acquired by Thrilltime Entertainment who renamed the ride system Top Eliminator Dragsters. Thrilltime also bought Sky Fun 1 (the manufacturer of Sky Coaster) and changed the company’s name to Sky Coaster, Inc. Then Thrilltime was acquired by Ride Entertainment Group in 2005. 2. 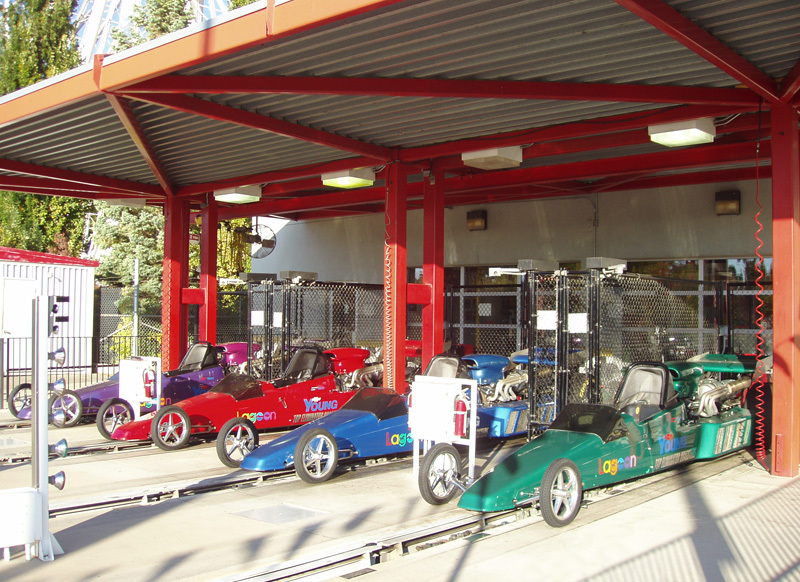 Newspaper articles in 1996 stated the dragsters were being manufactured at International Armoring in Ogden, but never goes into detail about what parts of the ride they were responsible for or if they were involved in other installments of the ride. Rosebrock, Don. Lagoon Drag Strip Ride Gets Green Light. Deseret News, 12 Jan 1996. Arave, Lynn. Lagoon Will Be 2nd To Rev Up The Top Eliminator Dragster. Deseret News, 31 Mar 1996. Let Lagoon Entertain You. Deseret News, 24 May 1996. Dragster finally revs up after late start at Lagoon. Deseret News, 9 Sep 1996. Arave, Lynn. Vroom! Lagoon’s Latest Puts Riders In A Race. Deseret News, 16 Sep 1996. Cowan, Chris. Six Flags Kentucky Kingdom. Theme Park Timelines, accessed 21 Feb 2015. Top Eliminator. Ride Entertainment Group, accessed 26 Mar 2015. Private message to author from user “linearinduction” via LagoonIsFun.com, 23 Mar 2015.